Twitter. Facebook. LinkedIn. YouTube. Digital media. These buzz words are getting a lot of attention. From teenagers and grandparents posting profile pics on Facebook, to celebrities sharing their “genuine” love for cheeseburgers and purses on Twitter and HR professionals recruiting potential employees on LinkedIn, there’s no segment of society that hasn’t been impacted by digital media. And that includes business. There’s no doubt that digital media can be profoundly beneficial to businesses – that is, if it’s done right. With his book “The REAL Truth About Social Media”, Eric Harr sets out to help businesses of all sizes master digital media. Harr is the founder and CEO of Resonate Social Media and when I @mentioned him on Twitter, he told me that his goal with this book was to introduce newcomers to social media and inspire and empower them. And this is most definitely the book’s target audience. Digital media strategists and enthusiasts will find this book pretty basic. But for business owners looking to get involved in social media, I think Harr hits his mark. I personally enjoyed his use of classic quotes from people like Shakespeare and Ralph Waldo Emerson, to underscore the fact that social media may be a modern invention, but its principles are founded on humanity’s timeless basic need to be social. He makes it clear that if businesses choose to ignore this fact, they are destined to fail. Harr spends a good deal of time on describing the various social media platforms and provides inspiring success stories for each of them. He then offers “actionable insights” for both personal and business use – instructions on how best to use each platform. This section would definitely bore regular digital media users, and I’m not sure the personal insights are necessary given the target business audience, but business owners will find that this section demystifies digital media and makes it seem “doable”. Directions on how to set clear goals for social media, identify Key Performance Indicators and measure progress at regular intervals. Appendices that include such valuable resources as 10 Simple Steps to Social Media Success and a Social Media Policy Template. Bottom line: with his conversational, enthusiastic tone, Eric Harr is sure to inspire businesses to dive into ditial media. And with the valuable tools he’s given them throughout this book, and in the appendices, they’ll have a pretty good chance of succeeding. 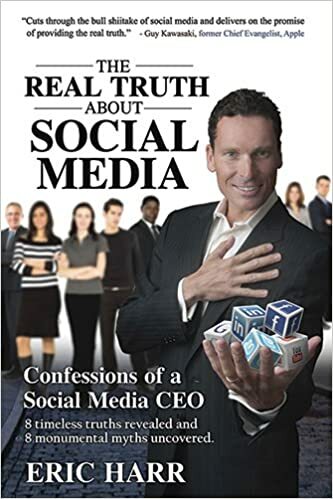 For more information about Eric Harr and “The REAL Truth About Social Media”, and to purchase the book, head over to Amazon.